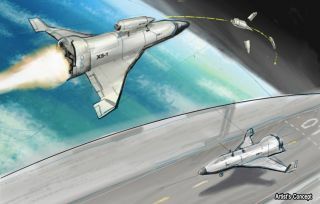 Artist's concept of DARPA's Experimental Spaceplane (XS-1), a proposed unmanned, hypersonic vehicle that the agency hopes will lower satellite launch costs substantially. Officials are targeting Mach 10 for the suborbital vehicle. SAN DIEGO — The United States military is kick-starting a suborbital hypersonic vehicle program that also aims to launch payloads into orbit on the cheap. The new program, run by the Defense Advanced Research Projects Agency, is called Experimental Spaceplane, or XS-1. It follows in the footsteps of previous DARPA hypersonic projects, such as the HTV-2 aircraft that reached 20 times the speed of sound in an August 2011 test flight. The XS-1 endeavor would allow routine access to space for a larger payload class — 1,000 pounds to 4,000 pounds or so (454 to 1,814 kg) — at about $5 million per launch, officials said. Former NASA astronaut Pamela Melroy is now deputy director of the Tactical Technology Office at the Defense Advanced Research Projects Agency (DARPA), scoping out low-cost access to space. "We’re looking for radical and disruptive changes," said former NASA astronaut Pamela Melroy, now deputy director of the Tactical Technology Office at DARPA. "We are about demonstrations. It’s not enough to just experiment. You have to actually prove it." Melroy, a retired U.S. Air Force colonel and test pilot, is no stranger to space. Before departing NASA in 2009, she flew on three space shuttle missions: STS-92 in 2000, STS-112 in 2002 and STS-120 in 2007. She served as pilot on her first two flights and commanded the third. After her NASA career, Melroy helped to investigate the 2003 space shuttle Columbia disaster and also served as the acting deputy associate administrator and director of field operations in the Federal Aviation Administration’s Office of Commercial Space Transportation, a body that is starting to develop regulatory approaches for private manned spaceflight. "This is not a single-stage-to-orbit," she said. "This is a suborbital, hypersonic vehicle that will also allow us to do advanced hypersonic testing as well. And of course we are going to launch a payload into orbit." Also taking part in the AIAA panel discussion was Kenneth Washington, vice president of the Advanced Technology Center for the Lockheed Martin Space Systems Company. Washington saluted DARPA's decision to start the XS-1 program. "I think all of industry has recognized that launch has been a major technical challenge and an area ripe for innovation," he said. Washington said his company’s invention, the Advanced Plastics Engineered for the Extreme (APEX) material, could play a role in the development of advanced vehicles such as the XS-1. He also flagged the promise of nano-diamond special coatings "and other things that are not yet ready to be talked about." Early artwork aside, DARPA has not yet committed to a winged design for the XS-1. The key is that it needs to have a reusable first stage, Melroy said. "We all know how expensive space has gotten," she said. The goal is to go beyond Mach 3, and "we actually think that getting to Mach 10 is the bigger reach that DARPA is looking for," Melroy added. "We’re headed for the big step with Mach 10." In earlier DARPA documents, Melroy’s Tactical Technology Office had sought technologies that would enable hypersonic vehicles to attain a wide range of operational altitudes from sea level to low-Earth orbit, depending on application. These hypersonic platforms, DARPA notes, must be able to operate through extremely high g-loads, while experiencing moderate to intensely high heat stresses. Melroy’s office is interested in technologies that provide a robust, reliable, affordable and innovative means for achieving access to space. The focus is on revolutionizing the responsiveness and flexibility of space systems by introducing "aircraft-like" space access. DARPA’s Tactical Technology Office is also interested in space vehicle technologies that allow access to a wide range of altitudes and inclinations and also enable highly efficient on-orbit maneuvers. "We’ve gone far too long without any serious experimental vehicles for launch technology," said Rand Simberg, an industry consultant and writer on space business, technology and policy. He is author of the forthcoming book "Safe Is Not An Option," which details what he views as the irrational risk aversion in spaceflight. "It is good to see that DARPA is agnostic on the best type of takeoff/landing approach…horizontal versus vertical," Simberg told SPACE.com. "What I think is important is that it take off the same way that it lands, if they want to get the kind of launch tempo they’re aiming at. Having to change the orientation of a vehicle — landing on a runway, then having to erect it to take off vertically — can be a killer on ground turnaround time." Simberg waved one red flag, however. "The danger, I think, is that they [DARPA] may neck down and eliminate alternatives too early…when they need to explore a variety of approaches. The other danger is that they’ll try to incorporate too many new technologies in a single vehicle," Simberg said. "Too many times an experimental program is just an excuse to push someone’s pet technology, even if it doesn't necessarily make economic or engineering sense," Simberg added. "I hope that they'll let the concepts drive the technology, rather than the other way around." Leonard David has been reporting on the space industry for more than five decades. He is former director of research for the National Commission on Space and is co-author of Buzz Aldrin's new book "Mission to Mars – My Vision for Space Exploration" published by National Geographic. Follow us @Spacedotcom, Facebook or Google+. Originally published on SPACE.com.